"A substantial satisfying meal. This stew is tasty served over rice or large egg noodles." 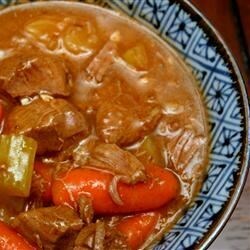 See how to make a classic stew with venison, carrots, and potatoes. This was the WORST recipe I have found on this webpage thus far. My husband and I couldn't make it past the gamey taste (and smell)! We were trying to use up some of our stored venison and came across this recipe. It was wonderful! Even our neighbor who said she hated venison liked this stew. I found this a very good way to use up the tougher cuts of meat on a deer. I used brown gravy mix in place of the flour to make a more robust stew.